Before fossil fuels, wind was man’s major source of power for sailing ships, grinding grain, and pumping water. The beauty of ships and windmills were an endless source of inspiration for painters and photographers. Windmills were once the source of power for providing water in rural America, such as the one in the picture with the giant wind turbines towering over it. Though some criticize the wind turbines for being unsightly, they have a majestic beauty of their own. Their real beauty is in their utility as, once built, there are no fuel costs or emissions. Much of the criticism of wind power has come from the fossil fuel industry, as it is hard to compete against a technology with no fuel costs and few regulatory problems. Fossil fuels now have a near monopoly on providing energy, and consumers would benefit from more competition in that market. Fossil fuels have served us well and we will certainly need them far into the future – even to develop sustainable energy sources. But there is a trap if we wait too long, as the rising price of traditional fuels will also increase the cost of building the renewable sources, possibly leading to an energy shortage before renewable sources can make up the difference. 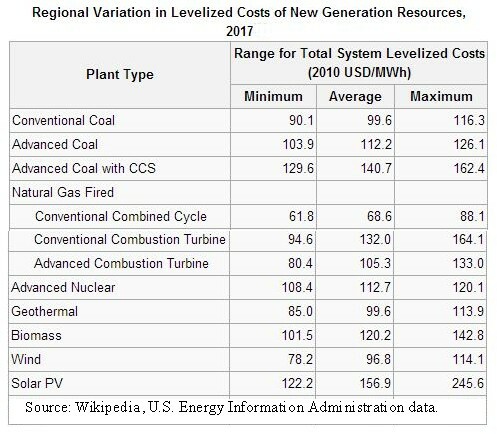 Cost: As the cost of building new coal fired plants has increased prohibitively, a number of US power companies have taken advantage of wind energy to increase the supply to their customers and lower their costs. Recently, AEP/PSO in Oklahoma was able to meet the demand caused by the heat wave in 2012 by bringing 200 megawatts (MW) of wind energy online. 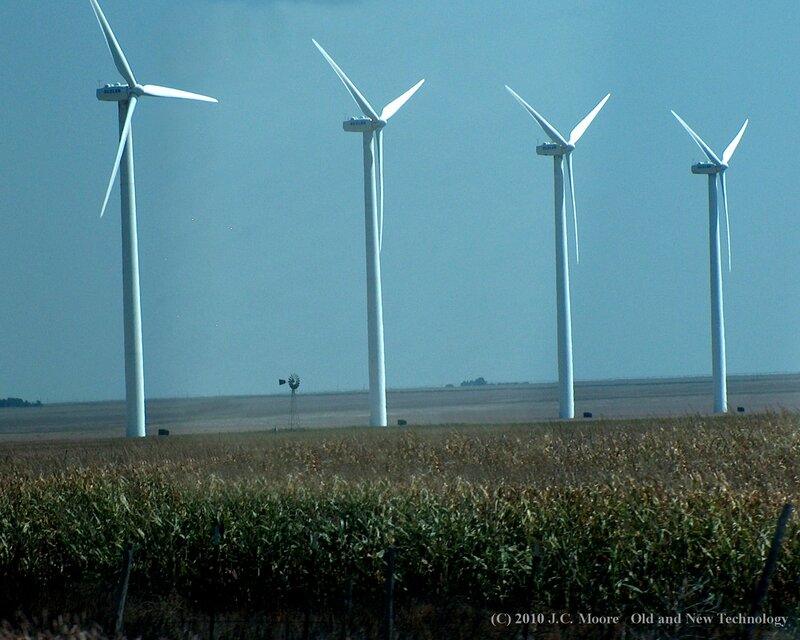 It recently planned to purchase 200 MW more, but took advantage of an opportunity to contract for an additional 600 MW of wind energy from facilities being developed in northwestern Oklahoma. AEP/PSO said the cost was now less than building new coal fired plants, and that the purchase will save an estimated $53 million in the first year and even more thereafter. The declining cost of wind energy is making it competitive to natural gas as well. Wind contracts in Texas, about one quarter of all US installations, are now regularly below $30/MWh. Even with a tax incentive, this still puts wind well below $50/MWh, while the comparable cost for a new gas plant is above $60 /MWh. New design and siting where there are good wind conditions allows Texas wind farms to get capacity factors around 50%. Nearly half of that occurs during peak load, defying characterizations of wind as essentially an off-peak power source. Capacity: One criticism of wind energy is that it will not be able to supply enough power to replace the fossil fuel sources. 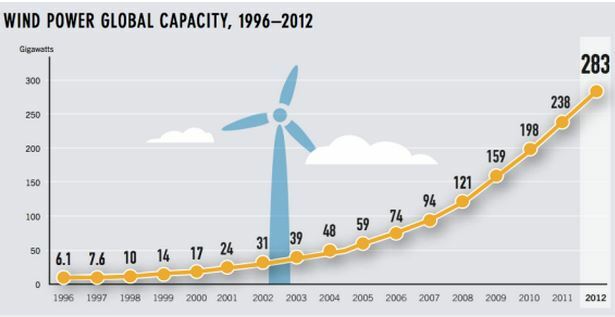 Wind currently supplies about 3% of the worlds electricity and is growing 25% each year, meaning that it will double about every three years.The graph on the right shows the worldwide growth of wind power. Last year, wind farms in the U.S. generated 60,000 megawatts of energy, enough to power 15 million homes, and provided 81,000 jobs nationwide. Another criticism, based on a misunderstanding, is that there is not enough available space. Each windmill requires about about 14 acres of air space to insure they do not interfere with each other but they require much less land space, about 0.3 acres per turbine. Landowners can use the area below the windmills for farming or livestock, and they are compensated by a 5% royalty, about $3000 to $5000, as each turbine generates about $80,000 in electricity. Startup costs: To compare the costs of building new plants, the levelized costs of primary energy sources have been estimated for different regions of the country. Levelized costs include all the costs of building a new plant and running it for a 30-year cost recovery period, regardless of the expected lifetime of the plant. Wind turbines may have a much longer recovery period, as some windmills in Holland have been operating for two centuries, though some of the gears are made of wood. Though the table show some types of gas fired plants to be less costly that wind energy, the levelized costs do not include external costs, i.e., the costs indirectly borne by society. The external costs for fossil fuels do not include health and environmental damage from particulates, nitrogen oxides, sulfur oxides, chromium, mercury, arsenic, and carbon emissions. An EU funded research study, Externalities of Energys , found that including externalities would increase the cost of producing electricity from fossil fuels by a factor of 30% for natural gas to about 90% for coal, if costs to the environment and to human health were included. If we include the costs of letting fossil fuel release their waste products into the environment, then sustainable energy sources have a big cost advantage. Criticisms: The intermittency of the wind is a problem, as is the lack of a way to store the energy. Putting wind electricity into the power grid solves some of the problem, as conventional sources can take up the slack. Each unit of wind energy put on the grid saves about three times as much in fuel energy, as conventional plants are only about 30% efficient. Better storage technology is under development , but conventional sources will be needed as backup in the mean time. Subsidies: While once the problem was getting electricity to rural America, the problem now is getting wind electricity from rural areas to population centers. It will require a large investment in research and infrastructure to develop wind energy. As Washington struggles to balance the U.S. budget, possible cuts in subsidies has created an uncertainty hindering investments in wind energy. While it is the national interest to subsidize the development of sustainable energy resources, a much larger share of tax breaks go to well established and profitable fossil fuel companies. The United States’ yearly subsidies to the fossil fuel industries amounts to about $13.6 billion, while all renewable energy subsidies together amount to about one sixth as much. Our energy needs will best be served by a mixture of traditional and alternate energy sources, and we should not let unfair criticisms or politics keep us from developing the alternate sources. This entry was posted on Wednesday, February 12th, 2014 at 12:04 pm	and is filed under Energy and the Environment. You can follow any responses to this entry through the RSS 2.0 feed. You can leave a response, or trackback from your own site. It’s an awesome piece of writing designed for all the web viewers; they will take advantage from it I am sure. -The second section is a practical analysis. career choice that will provide unlimited experiences to you in the health career field.